Gigli. “Di quella pira,” songs + excerpts from Rigoletto, Africana, Mignon, Favorita, Marta and Elisir (a total of four high Cs). (U.K., 1935). 73m. Dialog filmed in English (not dubbed). B&W. 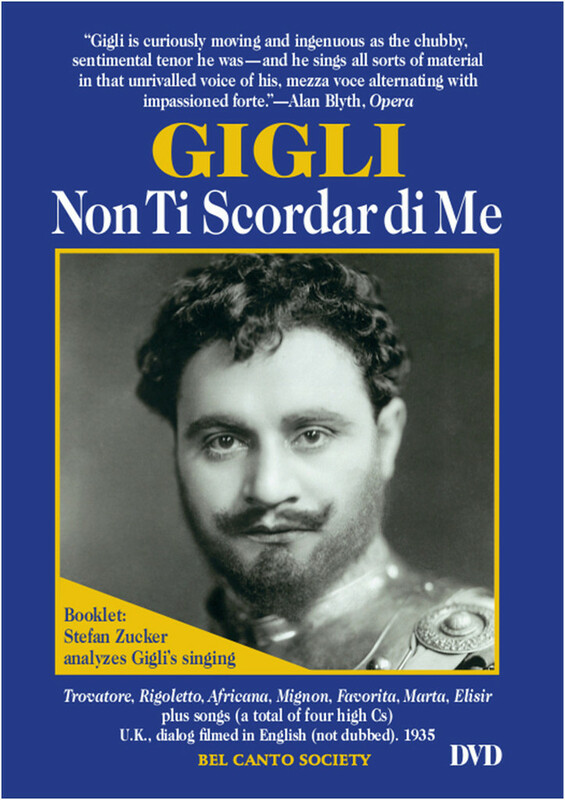 Includes a 28-page booklet with an analysis of Gigli’s singing by Stefan Zucker plus many rare photos. In the film Gigli uses closed tones, covered tones and open tones. The booklet points out where he is employing which kind of tone, track by track. Together the DVD and the booklet should help those perplexed by the discussion of closed, covered and open tones in Franco Corelli and a Revolution in Singing. This is the title customers most frequently reorder to give as a gift. And no wonder. One woman wrote Gigli that in 30 days she had seen the film 76 times. “Of the Bel Canto Society videos I have sampled, three comprise films from the 1930s enshrining the art of Gigli (two) and Schipa (one). At that period famous singers appeared regularly in films to spread their popularity. Each shows the direct, unsophisticated appeal of these two gifted artists, suggesting the power of the tenor voice to cure most ills. “Gigli is cast twice, in his first and second films, Non ti scordar di me (in English, despite its title) and Ave Maria (BCS Video #511), as a middle-aged singer who has recently lost his wife. In the first he marries a young girl who’s on the rebound from an affair and remains faithful to him (just) when her lover returns–again through the appeal of his voice. In the second his singing wins him the love of a cabaret artist who has been inveigled into conning him. In both Gigli has ample opportunities to deploy his art, the true, honest quality of his singing saving him and the plot from sentimentality. A big hit, this film, Gigli’s first, became the prototype for several of his others: he plays the cuckold, the most ignominious figure in Italian culture. Not only does he sing his heart out but Non ti scordar di me is sensitively written and directed and has a touching ending. What sets Gigli apart from nearly all other 20th-century tenors? His singing is full of contrast. Such 19th-century holdovers as De Lucia varied dynamics and tone color as well as rhythm and, sometimes, notes. Most singers since at best have had or have created one sonority of individual character, at one dynamic level. Caruso and those who followed him mostly sang at full voice. Pavarotti and company do little varying of dynamics and seldom shade their tones, using the same color to express both happiness and sadness. Gigli had many sonorities and two basic dynamic levels, loud and soft. Non ti scordar di me finds him in peak form and provides a key to some of his best art, making clear that it was based on chiaroscuro–the contrasting of tone colors, usually in response to words, and of soft passages with loud. He repeats the title song, singing it differently. Gigli made extensive use of a vocal technique known as “covering,” involving darkening the tone and modifying vowels, almost as if some were schwas (like the “uh” sounds in “America”). Early in the film he sings a song, “Mille cherubini in coro,” “closed”; repeating it later, he covers so heavily that if you aren’t sure to what the term refers, you’ll know after hearing him do it.